I was looking through some of my old finds, specifically a briefcase where I store random jewelry, knick-knacks and miscellanea and came across this thing I found more than a year ago. It came along with a bunch of other stuff, including some old Olympic paraphernalia I sold for decent money online. 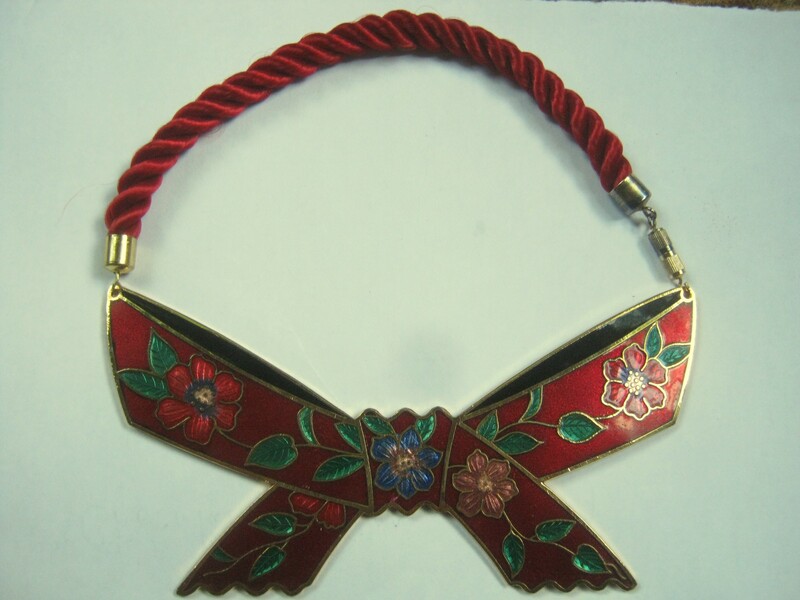 It’s quite beautiful and features some really nice enamel but I have no idea what it is. The rope clips on to the bottom piece as a necklace might but it’s way too small to fit around someone’s neck. The bottom part is around 4.5 inches long if that tells you anything. I’m always interested to learn so let me know if you have an idea, even a guess as to what it might be! I also came across these vintage earrings. I’ve seen them before but this time I noticed their sterling silver marks. This gives them a bit more value for selling on Etsy. These earrings were just one of the many things I found inside that pillowcase of jewellery a couple of months ago. Much of it is still around, waiting for someone to find it at my next yard sale, and maybe someone will find a treasure that I missed. If so, so it goes. It’s super hot here but there’s supposed to be a thunderstorm coming this way. Should be fun! The first thing that came to mind was that it might have been a decoration to hang around a wind bottle. It is a cloisinee doorknob hanger and very pretty.Probably Chinese but it could also be from the Middle East.The earrings are also spectacular but I can’t tell where they are from. Does it say TAXCO or TAXO anywhere?If yes,they are from Mexico.Are they heavy?Very beautiful,let me know when you are having your next yard sale,I will come by and make a bid. Nope, it looks like it says MBH (probably a maker’s mark) in addition to the 925 Sterling mark. I’ll keep you posted about the yard sale. These being sterling I’d be asking a bit more for them, 15$ perhaps? 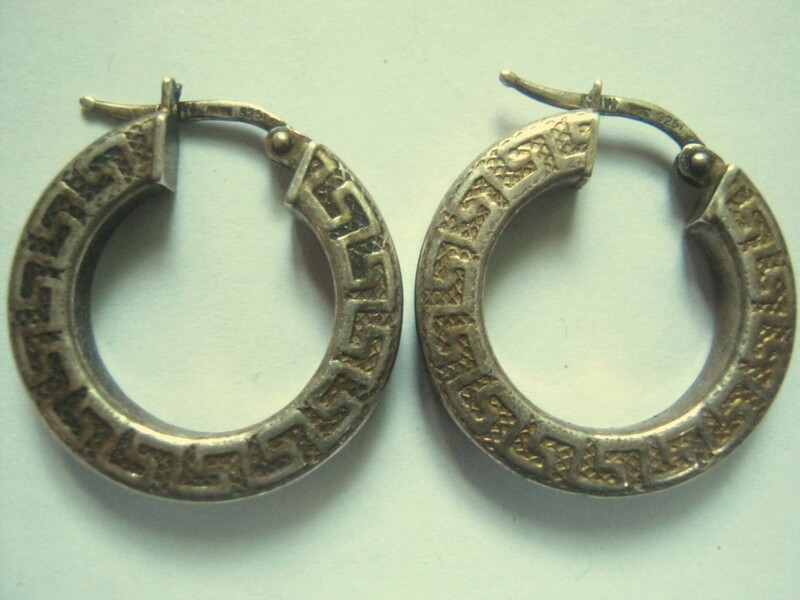 Your silver earrings display the Greek key pattern. Hm, a small wall hanging, maybe? Martin,I love biking like you do.Friday morning I biked along the whole length of the La Chine canal from the Peel Basin right up to Ville La Chine.This is more than 25 kms.I loved it.I started at 5:30 am in the morning and it was great fun.Along the way,I passed the neighborhoods of Point St.Charles,St.Henri,Cote St.Paul,Ville Emard,La Salle and La Chine. Next week,I am going to bike on Gouin boulevard from Pie IX boulevard in Montreal North and go right up to Pierrefond.I will pass the neighborhoods of Montreal North,Ahuntsic,Cartierville,Ville St.Laurent,Roxboro and Pierrefonds.I hope you do the same for recreation.In between,I stop for taking photos. I wish you a happy summer and lots of fun,fun,fun.It is finally very nice and cool after four days of very hot,humid weather and some heavy rain.Please get up early and check out a lot of different areas for curbside treasures in the trash.It is the beginning of the month and a lot of people have moved so it is hard to believe no good treasures will be found in the trash.You can check the trash after midnight in the darkness instead of waking iup early.